This resource was put together by volunteers from Track The Ban, Vigilant Love, and Ajam Media Collective, as well as independent members of our larger communities. On Friday, January 27, 2017, President Trump signed an Executive Order (EO) barring travel and immigration to the United States for individuals from seven countries: Iran, Iraq, Libya, Somalia, Sudan, Syria, and Yemen. U.S. Customs and Border Protection (CBP) detained, deported, and restricted individuals with varying immigration statuses, including: refugees, lawful permanent residents (also known as LPRs or green card holders), temporary visa holders, and non-U.S. dual nationals. As of February 6, 2017, there is a temporary restraining order on EO 13769. Effective February 3rd, 6:40 EST, the order returns U.S. customs and visa entry protocol to “normal.” The DOJ has until Feb 6th, 6:00pm EST, to submit additional legal briefs to the 9th U.S. Circuit Court of Appeals in San Francisco to support the DOJ’s emergency motion to overrule the temporary restraining order on the EO. In the 10 days since the ban’s implementation, chaos has ensued over its constitutionality. A rapid succession of political, legal, and activist developments took root as a response. The intention of this guide is to clarify the conflicting narratives regarding the ban by creating a brief summary of the events that have occurred from the introduction of the EO to the time of this writing (February 6, 2017, morning EST), which includes an easy-to-use timeline, key terminology involved in this discussion, and access to other sources for further information. Attorney General (AG): Attorney generals are the main legal advisors to the United States government. In some jurisdictions, they may also have executive responsibility for law enforcement, prosecutions, and general legal affairs. The U.S. Attorney General is the head of the Department of Justice (DOJ); each state also has its own attorney general. Department of Homeland Security (DHS): The Department of Homeland Security is a cabinet department of the U.S. government that was created in response to the September 11th attacks. Its stated mission involves preparing for, preventing, and responding to domestic emergencies, especially terrorism. DHS oversees Immigration and Customs Enforcement (ICE), Customs and Border Protection (CBP), and Citizenship and Immigration Services (CIS). U.S. Customs and Border Protection (CBP): The U.S. Customs and Border Protection is the federal law enforcement agency of the DHS. CBP responsibilities include enforcing U.S. regulations related to immigration, trade, and customs, as well as regulating international trade. CBP’s goals are anti-terrorism and facilitating trade and travel. CBP officers are federal law enforcement officers who perform duties under the law and DHS regulations, which include arrests, conducting searches, making seizures, bearing firearms, and serving orders. CBP includes Border Patrol Agents, who are federal law enforcement officers patrolling the U.S. borders. Immigrations and Customs Enforcement (ICE): Immigrations and Customs Enforcement is a federal law enforcement agency under the DHS that has two main functions: overseeing Homeland Security Investigations (HSI) and heading Enforcement and Removal Operations (ERO). ICE is the second largest U.S. government investigative agency after the Federal Bureau of Investigation (FBI). Department of Justice (DOJ): Also called the Justice Department, the Department of Justice is a federal executive department headed by the U.S. Attorney General. Its responsibilities include representing the U.S. in legal matters, running the federal prison system, and administering the FBI and DEA (Drug Enforcement Agency). Executive Power: Executive power refers to the president’s powers to manage national and government affairs by issuing executive orders, which have the binding force of law. Executive Order (EO): An Executive Order is a rule that the president issues to an executive branch of the government. 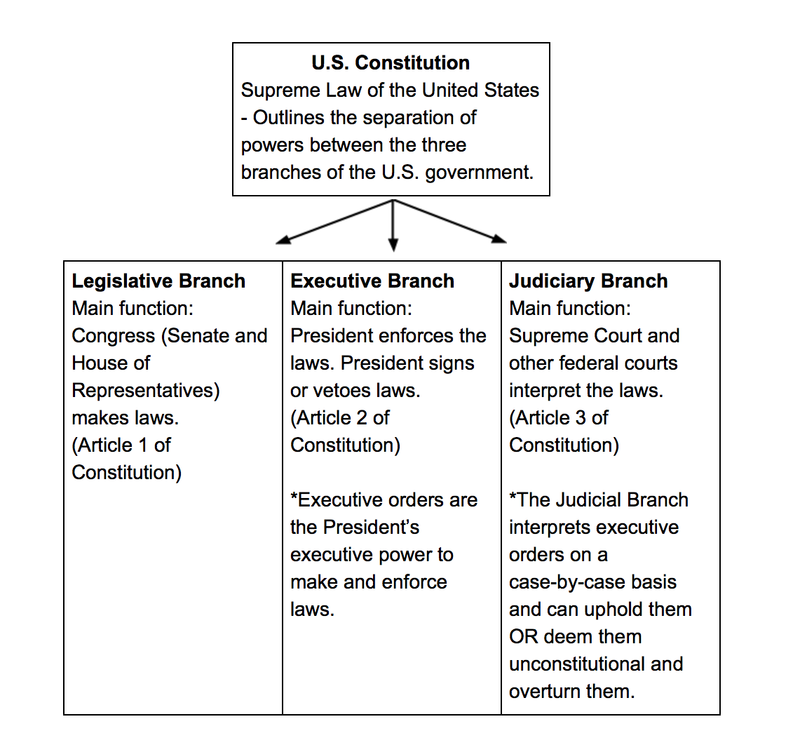 Executive orders have full force of the law, but are subject to judicial review. President: The elected head of the U.S. who represents the “Executive Branch” of the government. Temporary Restraining Order (TRO): A judge issues a temporary restraining order to prevent a person or entity from beginning or continuing an action that threatens or invades the legal rights of another. To obtain a TRO, a party (for example: the people of Washington State) must convince the judge that said group will suffer immediate irreparable harm unless the order is issued. January 27, 2017, between 4 and 5pm: President Trump signs Executive Order (EO) 13769 (The White House, Office of the Press Secretary). The EO suspends all refugee admission for 120 days and bars Syrian refugee access indefinitely. The EO also prevents general entry of foreigners from Iraq, Syria, Iran, Sudan, Libya, Somalia, and Yemen into the U.S. for 90 days, including those with temporary, student, and employee visas. The EO also blocks legal U.S. residents with green cards, from these seven countries, from reentering the United States. The actual text of the EO was not released for 3 hours after signing (Pro Publica). January 27, 2017, 4:30pm EST: The Department of Homeland Security (DHS) orders U.S. Customs and Border Patrol (CBP) to enforce the executive order (New York Daily News). January 28, 2017, 7:29am GMT: The DHS, in an email to Reuters, reports that the EO bars green card holders from Iraq, Syria, Iran, Sudan, Libya, Somalia, and Yemen from re-entering the U.S. White House officials announce these green card holders will need a waiver, granted on a case-by-case basis (Reuters). January 28, 2017, 7:25am EST: Two Syrian families (two brothers, their wives, and two children) are detained in Philadelphia International Airport (PHL) in Pennsylvania after disembarking a Qatar Airways flight. They have visas and green cards. Three hours later, they are sent back to Doha (NBC Philadelphia). January 28, 2017, approx. 2:00pm EST: Protesters begin to arrive at PHL. They are later joined by Philadelphia Mayor Jim Kenney, Pennsylvania’s Senior Senator Bob Casey, Congressmen Dwight Evans and Bob Brady, and Governor Tom Wolf (WNEP). January 28, 2017, approx. 3:30pm EST: Protests begin at Logan Airport in Boston. Protestors are later joined by Senator Elizabeth Warren (Democrat – Massachusetts) (Boston Globe). January 28, 2017, afternoon: Protests begin at John F. Kennedy International Airport (JFK) in New York after eleven travelers are detained. Similar detainments and protests take place throughout the U.S., including other major airports (New York Times, NPR). January 28, 2017, 9:00pm EST: Judge Ann M. Donnelly of the Federal District Court of Brooklyn, New York, issues an emergency stay against EO. The emergency stay keeps the government from deporting detained individuals with valid visas or refugee status (New York Times), but doesn’t allow them to enter the country. This includes those in transit when the emergency ruling was filed. The ruling is temporary, but nationwide (Mother Jones). January 28, 2017, approx. 9:00pm EST: Judge Leonie Brinkema of U.S. District Court of Eastern District of Virginia issues a temporary restraining order that grants lawyers to all legal permanent residents who are detained at Dulles International Airport in Washington, D.C. and blocks deportation of permanent residents for seven days (NPR). January 28, 2017, approx. 12:00am EST: Judge Thomas Zilly of U.S. District Court of Western District of Washington blocks the deportation of two individuals after immigration advocates file an emergency motion arguing that the EO violates the due process rights of the individuals (Washington Times). January 28, 2017, approx. 12:00am EST: Two Iraqis held at JFK, Hameed Khalid Darweesh and Haider Sameer Abdulkhaleq Alshawi, are released after legal efforts by the ACLU. These are the defendants in the case that Judge Donnelly had ruled on a few hours before (New York Times). January 29, 2017, 1:51am EST: Judge Allison Burroughs and Magistrate Judge Judith Dein of U.S. District Court of Massachusetts issues a seven-day restraining order against the EO. The ruling prohibits federal officials from detaining or deporting immigrants and refugees with valid visas or green cards based solely on the EO. The judges also instructed CBP to notify airlines overseas that it is safe to put immigrants on U.S.-bound flights. The order is in response to a suit filed by the ACLU on behalf of two Iranian University of Massachusetts Dartmouth professors detained and interrogated at Logan Airport (Boston Globe). January 29, 2017, approx. 12:55pm EST: DHS states that they will “comply with judicial orders,” but continue to implement the EO directive (Department of Homeland Security). The federal government faces increased criticism from Republican and Democrat lawmakers (Washington Post). January 29, 2017, 3:33pm EST: DHS reverses previous stance and states that green card holders will be allowed into the U.S., regardless of their country of origin (DHS Twitter Account). January 29, 2017, 11:42am PST: Sixteen State Attorney Generals (from New York, California, Pennsylvania, Washington, Hawaii, Virginia, Oregon, the District of Columbia, Connecticut, Vermont, Illinois, New Mexico, Iowa, Massachusetts, Maine and Maryland) release a joint statement, declaring the EO unconstitutional (Boston Globe). January 29, 2017, 10:34am EST: Republican Senators Lindsey Graham and John McCain criticize the EO, suggesting it “sends a signal, intended or not, that America does not want Muslims coming into our country.” They express fear it will contribute to “terrorist recruitment” (Washington Post). January 30, 2017, afternoon EST: Sally Yates, Acting Attorney General, issues a memo expressing serious doubts over the legality of the EO. She orders Department of Justice (DOJ) lawyers to not defend against legal challenges to the EO (Washington Post). Yates, thus, overrules the DOJ’s Office of Legal Counsel’s previous finding that the EO is acceptable “with respect to form and legality” (New York Times). January 30, 2017, 1:04pm EST: Washington State Attorney General Bob Ferguson announces plans to file a federal lawsuit to seek an immediate stop to the implementation of the EO (Washington Post). January 30, 2017, afternoon EST: The Council on American-Islamic Relations (CAIR) files a lawsuit in U.S. District Court in Alexandria, Virginia, challenging the EO. The lawsuit claims that EO creates “a denominational preference against Islam as a religion,” and violates First Amendment protections against religious discrimination (New York Times). January 30, 2017, 8:26pm EST: Several sources report that House Judiciary Committee staffers helped Trump’s aides draft the EO without informing GOP leaders and were required to sign non-disclosure agreements. GOP leaders not informed include Speaker of the House Paul Ryan (Republican – Wisconsin), Majority Leader Mitch McConnell (Republican – Kentucky), Republican Committee Chairman Reince Priebus, DHS director John Kelly, and soon-to-be Secretary of State Rex Tillerson (Politico, Axios). January 30, 2017, 9:00pm EST: Dana J. Boente is sworn in as Acting Attorney General until Congress acts to confirm Jeff Sessions, currently a Republican U.S. Senator – Alabama. Boente announces that his first act in this role will be to rescind Yates’ order (New York Times). January 30, 2017, 9:15pm EST: President Trump fires Attorney General Sally Yates (New York Times). January 30, 2017, 9:17pm EST: White House Press Secretary Sean Spicer issues a statement criticizing former Attorney General Sally Yates: “Ms. Yates is an Obama administration appointee who is weak on borders and very weak on illegal immigration” (New York Times). January 31, 2017, 4:00pm EST: A State Department dissent cable (letter) that sharply criticizes the EO collects more than 1,000 signatures from diplomats, American officials, and embassy workers (New York Times). February 1, 2017, afternoon EST: The Department of Homeland Security’s Office of the Inspector General (OIG) announces that it will investigate DHS’s implementation of the EO. The OIG will also review “adherence to court orders and allegations of individual misconduct on the part of DHS personnel,” (OIG, New York Times). February 1, 2017, 8:49pm EST: Most Democratic members of Congress have opposed or expressed criticism of the EO. Of Republican Congress Members: 42 critical; 106 support; 144 silence or no position (Vox). February 2, 2017, approx. 7:00pm EST: On MSNBC’s Hardball with Chris Matthews, Counselor to the President Kellyanne Conway cites the “Bowling Green Terrorist Massacre,” allegedly carried out by Iraqi refugees, as a case for implementing the EO. It is soon after confirmed that this terrorist attack never occurred (Washington Post). February 2, 2017: Fifty ACLU affiliates file eighteen Freedom of Information Act requests with local U.S. Customs and Border Patrols in an effort to expose how CBP officials are interpreting and executing the Muslim ban in violation of federal court orders (ACLU). February 3, 2017, approx. 1:00pm: The State Department reports that approximately 60,000 visas have been revoked under the ban (Los Angeles Times). February 3, 2017, approx. 5:00pm EST: Federal Judge Nathaniel Gorton, from the District of Massachusetts, decides not to extend a temporary restraining order granted January 29. Gorton argues that the plaintiffs listed in the suit are either not affected or are now in the country and are unlikely to be deported (WBUR News). February 3, 2017, 3:40pm PST: Judge James L. Robart, U.S. District Judge, Seattle, Washington, rules in favor of a suit filed by the states of Washington and Minnesota earlier in the week, granting a temporary restraining order against the EO, effective nationwide. Effective immediately, the order returns U.S. customs and visa entry protocol to “normal” (Washington Post). February 4, 2017, 5:12 am EST: President Donald Trump lashes back about Judge Robart’s ruling by tweeting, “The opinion of this so-called judge, which essentially takes law-enforcement away from our country, is ridiculous and will be overturned!” (Twitter). February 4, 2017, approx. 12:00am EST: Department of Justice files an emergency motion to the U.S. 9th Circuit Court of Appeals, requesting an immediate stay (overrule) on Judge James Robart’s order to impose a temporary restraining order on the EO (NPR). February 5, 2017, approx. 3:00am EST: Judge William C. Canby, Jr. and Judge Michelle Taryn Friedland, U.S. Court of Appeals, 9th District, San Francisco deny the DOJ’s request for an emergency stay, pending full consideration of the motion. The EO remains suspended for the time being. The court requires attorney generals (AGs) in Washington and Minnesota to submit written responses by 4pm EST on Monday, Feb. 6 and the DOJ lawyers to reply by 6pm EST (Washington Post). February 5, 2017, 3.39pm EST: President Trump continues to attack Judge Robart. Vice President Mike Pence defends President Trump’s criticisms (New York Times). February 5, 2017, 12:42 pm EST: President Trump tweets that he has instructed Homeland Security to continue careful checks of those coming into the country. “I have instructed Homeland Security to check people coming into our country VERY CAREFULLY. The courts are making the job very difficult!” (Twitter). Featured image of a reunited Syrian family, source.